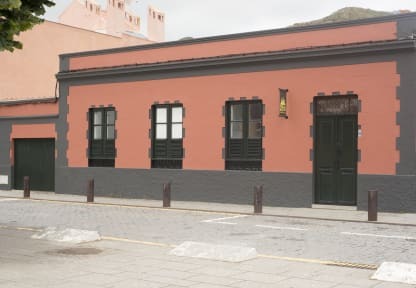 Patio Hostel i Tenerife, Spanien: Reservér nu! Patio Hostel, is an urban hostel located in a colonial house from 1915 with all the comforts of our time; hot water, kitchen, library, internet connection ... and involved in nature, sustainability and recycling. 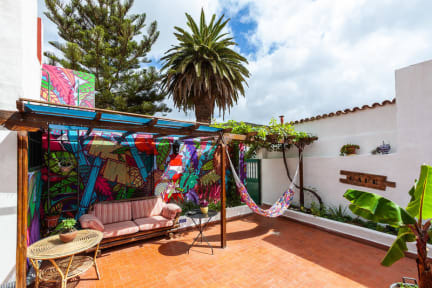 Staying in this house in the heart of La Laguna wil be a unique and different experience with fun atmosphere during the day and quiet to sleep at night. Market with local products, squares and pedestrian streets, hiking routes from the Hostel. We are located in an Cristobal de La Laguna , one of the most beautiful areas of the island of Tenerife. Near to our facilities you can fins and explore some of the finest landmarks and attractions of our island such as Catedral de la Laguna, Plaza del Adelantado and Museum of Science and the Cosmos. In addition, from our location is piece of cake reach Santa Cruz de Tenerife and Parque Nacional el Teide. We have 3 mixed dorms, each dorm accommodates 6 people. All of them with quality bunk beds, matresses, individual lockers to keep your belongings safe, a reading light and an electrical plug just by your bed to charge all your devices. Perfect for travelers! In addition, we have have a private room for those that prefer a bit more privacy but still want to feel the hostel vibe that can host up to 4 people.The room comes with some nice antique furniture, quality bunk beds, mattresses, a reading light and an electrical plug just by your bed to charge all your devices. The room has views to the famous square 'Plaza del Cristo' with the local farmers market.